Magna-Power Electronics, a world leader in programmable power products, announced a major upgrade to its popular rack-mount TS Series MagnaDC programmable DC power supply line, with 102 new models providing up to 25 kW in 4U (7.0” height) and 50 kW in 8U (14.0” height). The TS Series, with its rugged current-fed power processing topology combined with advanced microprocessor control, provides performance and functionality to address applications including: aerospace test and measurement, automotive component testing, semiconductor fabrication and component test, industrial and renewable energy, as well as general laboratory research and development. The upgraded TS Series features models at 4 power levels with greatly increased power density: 20 kW and 25 kW in 4U and 40 kW and 50 kW in 8U. 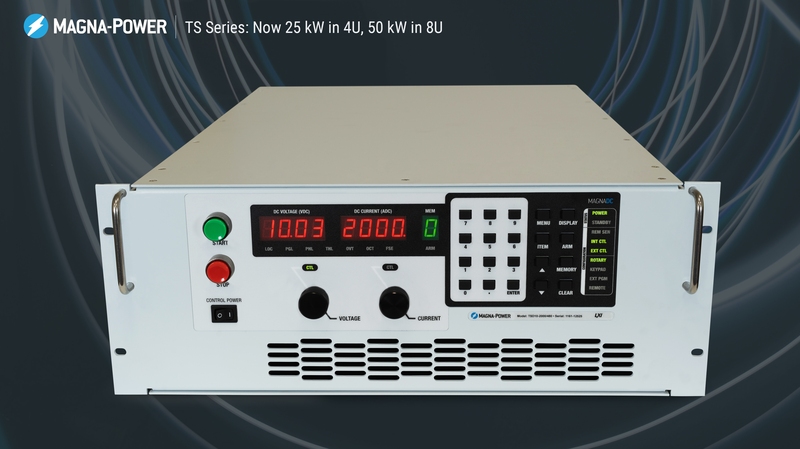 With major innovations on internally fabricated bus work, the upgraded TS Series offers very high currents—up to 2000 Adc in 4U and 4000 Adc in 8U—as a single power supply. Consistent with the existing TS Series, models are offered up to 4000 Vdc floating. All TS Series models come standard with monitoring and control from a variety of sources, including: front panel, computer interface and an isolated analog-digital I/O connector. A Standard Commands for Programmable Instrumentation (SCPI) command set is supported, allowing easy ASCII text programming over a computer interface. In addition, an IVI driver is included for the Visual Studio programming environment along with a dedicated National Instruments LabVIEW™ and LabWindows™ driver. Additional computer interface options include LXI TCP/IP Ethernet (+LXI), IEEE-488 GPIB (+GPIB), USB and RS-485. Standard protection features on the upgraded TS Series include a dedicated interlock input, programmable over voltage trip and over current trip settings, thermal protection, phase loss, fuse fault, and analog input programming line fault. In addition, when in standby or fault condition, a 3-phase contactor provides a mechanical break between the power supply’s power processing circuit and the AC mains, providing the user confidence of safe operating conditions. The upgraded TS Series models are available with three-phase input, including 380/400 Vac, 415 Vac, 440 Vac, or 480 Vac. All units are rated for continuous full power operation at 50 C.
All Magna-Power products are designed and manufactured at the company’s vertically integrated headquarters in Flemington, New Jersey USA. The company’s products are available directly from Magna-Power in the USA, through Magna-Power sales offices in the Germany, United Kingdom, and China or from a network of distributors in over 40 countries worldwide. The new upgraded TS Series, along with many other Magna-Power products, will be demonstrated at electronica 2018 at Magna-Power's stand A5.609, in Munich, Germany from November 13-16. Magna-Power Electronics designs, and manufactures robust programmable power products in the USA that set industry standards for quality, size, and control. Its products can be found around the world feeding power to national laboratories, universities, and a wide range of industrial sites. The company’s experience in power electronics is reflected in its 1.25 kW to 2000 kW+ product line, quality service, and reputation for excellence.